Dunk Tanks are a lot of fun! Great for fundraisers, school and church festivals, company picnics and employee appreciation days. Dunk your boss, school principal, pastor, girl friend ,boyfriend, your in-laws or your outlaws! There is no better feeling than hitting the target and watching your nemesis or best friend drop into that cold icy water. We recommend at least a 20' x 8' space for the dunk tank. 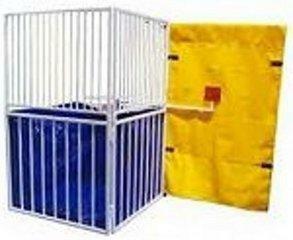 The dunk tank takes about 4' x 8' plus you need some room for throwing balls. Area should be away from glass, breakables and people. Customers are required to supply a water hose and the water to fill the dunk tank. We recommend setting up at least an hour before your event to have enough time for fill up. We also recommend placing the dunk tank in area were the water can be safely drained. Our Dunk Tanks come in 3 different colors: Red, White or Blue, so if you have a preference please make a note in the customer comments section of the order form.